In a city that has seen its share of colorful political figures, Martin M. Lomasney may lack the name recognition of a Kennedy or the notoriety of a James Michael Curley. Maybe that’s because, despite a 50-year career in which he did hold a number of public offices, his substantial political clout was largely cultivated in his unofficial capacity – as a ward boss. A ward boss was the de facto leader of a political machine, a fixture of municipal politics in America’s Gilded Age. Political machines were organizations that influenced elections and dominated other local affairs through a system of political favors and patronage. Unsurprisingly, allegations of corruption and voter fraud were frequent and widespread. But in a political system vulnerable to abuse, Lomasney was widely respected for his integrity and generally revered by his constituency. Unlike other ward bosses, Lomasney was quick to embrace immigrants, even greeting them on the docks upon their arrival in Boston. Granted, this was more about political expediency than genuine benevolence. But in a climate of fierce nativism, he treated immigrants in his ward the same as he did his other constituents (provided they could vote, of course). Not that Lomasney should be considered for sainthood. Plenty of his methods were ethically questionable, and his motives may have been entirely self-serving. But the fact remains that while many political bosses were rightly accused of cronyism and graft, Lomasney is remembered for fostering a sense of community. Nowhere was this more evident than in the old West End neighborhood he presided over – known on the Boston voting map as Ward 8. Political bosses are a thing of the past, and the boundaries of Ward 8 have been redrawn multiple times since Lomasney’s day. But more than 80 years after his death, Lomasney’s legacy of community building lives on in a new bar that honors the old name of his district. He’s right – Ward 8, which opened last December, sits on the outskirts of the North End, a block or two from the TD Garden. Populated mostly by office buildings, it’s an area people tend to pass through en route to Italian restaurants or sports pubs. The gorgeous marble bar is a modern touch in a room that evokes vintage Boston. The hardwood floor and subway-tile columns have a throwback look, and the exposed brick wall, with “Ward 8” painted in floor-to-ceiling characters, is visually striking. A set of tables look out onto the street, and a separate dining area offers a quieter alternative to the bar. The dim, candlelit ambience may recall intimate North End dining, while the plaid-clad staff and lively crowd give it the casual vibe of a Canal Street sports bar. But Ward 8’s menu offers thoughtful alternatives to both Italian food and typical pub fare. Described by Nick as “approachable, with a twist,” there’s a raw bar and selection of mouthwatering starters like butternut squash bisque and lamb meatballs. Comfort food staples like a burger, lobster roll, and mac and cheese are all given a modern spin by executive chef Kenny Schweizer. But the “Snacks & Sharing” menu is where you’ll find one of Ward 8’s most popular dishes – maple chili duck wings. Delicious but absurdly messy, the wings are sweet, spicy, and tender, with meat falling right off the bone. You might want to ask for a few (hundred) extra napkins, but they’re worth the trouble. 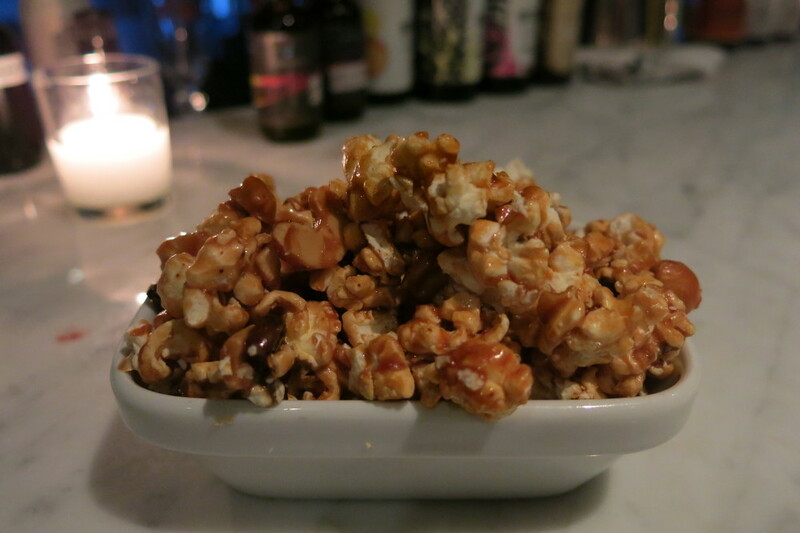 The bacon cashew caramel corn is just as good as it sounds. Sweet, nutty, and smoky, this is pure stick-to-your-teeth decadence. But the food menu isn’t the only thing that distinguishes Ward 8 from its nearby peers. “There aren’t a lot of places around here with this kind of cocktail program,” Nick notes. Cocktails that date back to the Gilded Age share space with tiki drinks and more contemporary concoctions. The Corpse Reviver, a blend of cognac, Calvados apple brandy, and sweet vermouth, is strong and smooth, with a mild bitterness. The Painkiller is fruity and potent. 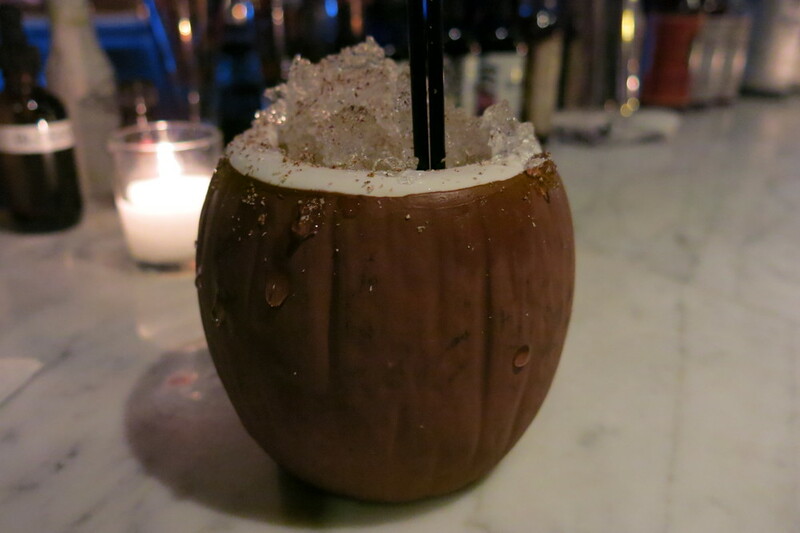 A mix of Pusser’s rum, pineapple juice, cream of coconut, and orange juice poured over crushed ice, it's served in a ceramic coconut cup and topped with a dusting of nutmeg. The Maharaja’s Revenge combines Old Monk rum, Apry (an apricot brandy), and fresh lime juice. With the vanilla flavor from the rum, the apricot, and the zing from the lime, this modern tiki drink is at home among the classics. The cocktails have their share of twists and innovations, but Mike uses Nick’s word to describe them: approachable. “It’s not like we’re making Martinezes or anything,” he says, referring to the bitter gin-based cocktail that has yet to enjoy the same resurgence in popularity as martinis and Manhattans. And yet the biggest hits are the drinks that might be considered the most daring. “The egg drinks are flying out of here,” Mike notes with surprise, referring specifically to the Pisco Sour and the Rye Flip. The Pisco Sour seems to be increasingly in vogue in Boston bars, and it’s easy to see why. Ward 8’s version, which combines Macchu Pisco, lemon juice, sugar, and egg white, is sweet, tangy, and creamy. Angostura bitters are decoratively swirled on the foamy top. The Rye Flip, made with Bulleit rye whiskey, a whole egg, sugar, cinnamon, and nutmeg, is perfect for a cold winter night. With a creamy texture from the egg, a little bite from the rye, and seasonal spices, all that’s missing is a roaring fire. Few drinks elicit more conversation and questions than the Oaxahan Old Fashioned, which offers an exciting twist on one of the oldest drinks in the book. 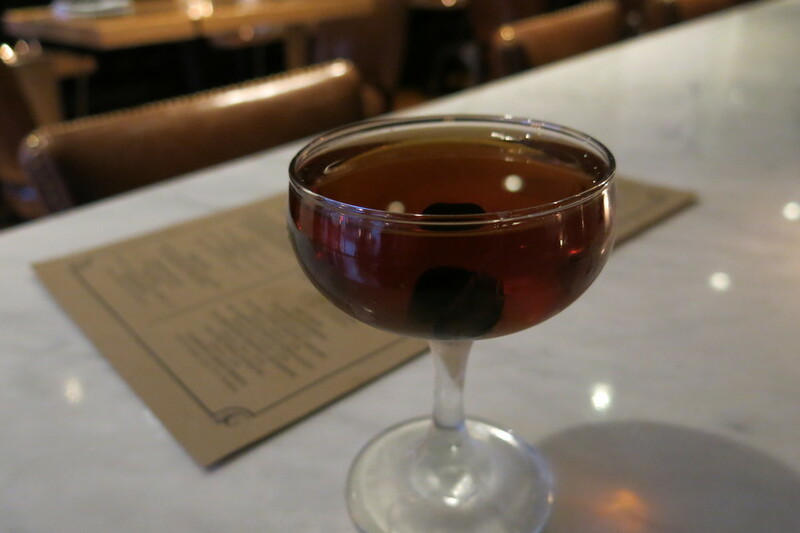 Ward 8’s version, based on a recipe by Death & Co., trades whiskey for a combination of tequila and mezcal, making for a strong, smoky drink. “Some people don’t even know how to pronounce it,” Mike says. “But they ask, and it sparks conversation. People ask about the difference between mezcal and tequila. And they really like the flaming orange,” he admits, referring to the match-lit orange peel garnish, which contributes a smoky citrus essence (I lament not capturing the momentarily flaming peel, but I was too mesmerized to operate the camera). The Moscow Mules, unfortunately, inspire not just conversation but larceny – the traditional copper cups they’re served in tend to disappear. “We got hit pretty hard last weekend,” he says with a sigh. If you're in the market for some copper mugs, Amazon.com is a good place to start. With buying options to fit any budget, there’s no need to pilfer Ward 8’s inventory. A small selection of House Cocktails is separate from the spirit-driven categories, but the plan is to eventually have a single, unified list. I’d say the original concoctions are already strong enough to stand alongside the traditional favorites. The Il Pompelmo is bright, tangy, and sour, with its combination of No. 3 gin, Campari, St. Germain, and grapefruit bitters. The New England Daiquiri, as its name would suggest, interprets the traditional Caribbean cocktail with regional ingredients – Berkshire Mountain Distillers rum and Vermont maple syrup. A mere half-teaspoon of syrup means the maple flavor doesn’t dominate the rum, allowing for a fairly restrained sweetness. And of course, no exploratory venture to Ward 8 would be complete without trying its namesake cocktail. The story behind the drink named for Lomasney’s neighborhood is a blend of history and legend, and its accuracy is subject to debate. But the generally accepted version goes something like this: on the eve of Lomasney’s 1898 election to the state legislature, his supporters, assured of their candidate’s victory, gathered at the Locke-Ober restaurant to celebrate. They asked the bartender to create a drink to commemorate the occasion. The resulting cocktail, a mix of rye whiskey, grenadine, lemon juice, and orange juice, was named for the district that ultimately tipped the election in Lomasney’s favor – Ward 8 – and was the signature cocktail of the Locke-Ober until it closed its doors in 2012. Ward 8’s excellent cocktail list is not static; I’ve seen several additions and subtractions just in the past few weeks. But if you get attached to a particular drink and it goes missing from the menu, don’t fret – Mike assures me that the small crew of well-trained bartenders can still make it for you. If cocktails aren’t your bag, there’s also a respectable offering of microbrews on draft and more in bottles. The draft options, like this smooth Left Hand Milk Stout on nitro, are served in chilled beer steins. And true to Nick’s word, there is indeed something for everyone. Prices are eminently reasonable. Drinks will run you $10 to $12, which is pretty standard for craft cocktails. Entrees range between $15 and $24, and there are plenty of good deals on the Snacks & Sharing menu. The bar can get a little loud, particularly in the after-work hours. But then again, Ward 8 is a place that’s supposed to have neighborhood energy. And who’d want to live in a dull neighborhood?